With Sonic Pi on the Raspberry Pi, you can make some noise by creating music. The following figure shows an example of a simple music track. Click the Run button at the top left. Did you hear a note? If you didn’t hear anything, go back to the Prefs and ­experiment with the settings until clicking Run makes a noise. If you do hear a note, click in the code window and press the Backspace key a couple of times to delete 70. Can you hear how the note changed? The sound — the pitch — is lower. You can play notes together. Those notes make a nice sound. That’s not such a nice sound, is it? Musicians know which notes sound good together, and which notes don’t. Music that sounds nice all the time is boring, so most music has a mix of nice and not-so-nice sounds and notes. 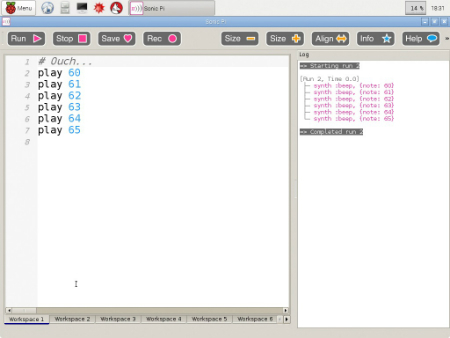 Sonic Pi reads the 1 as 1 whole beat. Most music uses shorter notes. You usually divide beats into half-beats, quarter-beats, and eighth-beats. For very fast music, you can use sixteenths or even thirty-seconds. Because Sonic Pi was made by programmers and not musicians, you have to give it a beat fraction as a decimal number. The following table is a cheat sheet for beat counting. Using different beats creates a rhythm, which makes a tune more interesting. Beats work well when all the numbers add up to a whole number — 1, 2, and so on. They don’t have to, but strange things happen if you try to play tunes with a different number of beats at the same time. Sonic Pi is designed for live coding — which means you can try out sounds and note patterns without stopping other sounds and note patterns.